With all of the competition in the e-reader marketplace, it was bound to happen. When the Amazon Kindle first jumped on the market as the lone ranger of paperless portable reading, it blew in with a $300 price tag. By the third generation of Kindle, the iPad arrived, a tablet computer that claimed to do it all for as little as $400. 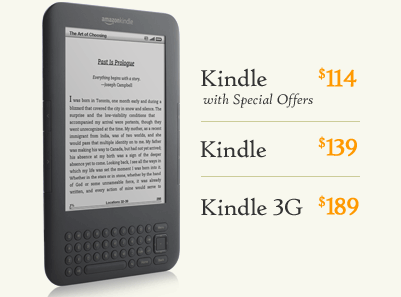 Amazon dropped the price of the newest family of Kindles to a mere $139, with only $50 more for 3G speed. The widespread availability of e-readers from different sources, even on the smart phone with a free app, has forced a need to constantly maintain the newest features at the best ever price. Screen-size improvements, lighter weight, and the advent of E-Ink’s new Pearl technology to produce a screen with 50% less glare than the original isn’t enough. E-reader consumers want to talk money. Amazon has met that price giant head-on with a next generation Kindle that sells for only $114, less than the cost of a high-quality leather bound edition of The Complete Works of Shakespeare. The catch? Shakespeare isn’t going to offer you $1 downloads in the music store. Amazon has taken on the challenge of fighting for consumer dollars by offering purchasers the option to pay less for a top-of-the-line e-reader, but the trade-off is advertisements strategically placed at the bottom of the home screen and as the screen saver, replacing the popular artistic images and author portraits that currently indicate the device is asleep. The English teacher in me wants to vomit at the thought of headlines offering swimsuits at half price splashed throughout The Grapes of Wrath, but the penny-pinching consumer in me is starting to think that Amazon is on to something huge. In one of the worst economic periods in my lifetime, Amazon has found a way to put e-readers into the hands of consumers who may have had to forgo the purchase yet again because the price was just a little too frivolous in this economy. The difference between the standard next generation Kindle and the new optional ad-Kindle is about the cost of a tank of gas, a fact that consumers are becoming more and more aware of when making non-essential purchase decisions. What makes the idea of advertising sprawled across my e-reader a little more palatable is the format which Amazon has chosen to use. The specification page on the Amazon website clearly states that adverts will only be visible while the device is asleep and while the reader is scrolling through the home screen for a title to read, not while a title is opened and being read. Plus, the advertising is limited to Amazon products and shopping partners. In other words, there won’t be any dancing pigs hawking 50 cents off your next purchase of bacon on your e-reader. Even better, the website claims that the advertisements will be for the daily specials and deals on Amazon and any of its web affiliates. In theory, owning the optional advertising Kindle will save the consumer money every day, not just in the form of the original lesser purchase price. Every time the reader reaches for the device, there will be advertising for which albums are free today in the Music Downloads, a coupon code for $30 worth of products for $10 in the Denim Shop, and more. I’ve long joked that my car spends so much time parked in front of the grocery store that they really should pay me to put their logo on it. Now, Amazon has found a way to do just that, to put their advertisements on millions of e-readers worldwide every day and to pass that savings on to people who have already demonstrated that they are happy customers. That is really some incredible article! I had a great fun. Thank you so much for sharing this valuable article stuff. Some useful points you have provided us. Amazing post!